How﻿﻿ long have you been playing golf? What’s your handicap or normal scor﻿e? Off and on since 1990. Stopped all together in 2008 and just started playing again. Normal score is around 110, but I WILL break 100 this year more the once! What do you love about golf? Early or late rounds are my favorites. The shadows and the rising/setting sun gives the course personality. What brings you to MyGolfSpy? Do you already know any other Spies? Insite and knowledge. Where are you from?﻿ What is your home course? Sarasota, FL. No particular home course. What are the best and worst things about golf in your region? Best: golf all year long. Worst: snowbird season, best weather & highest prices. What do you do for a living? Retired Navy, currently service manager at Lowe’s. 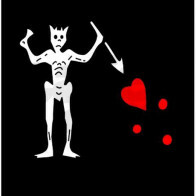 ﻿ How’d you pick your user name?﻿ The Pirate Queen anne's revenge and black beard the pirates flag is something I always did while in the navy. I just shortened the name.